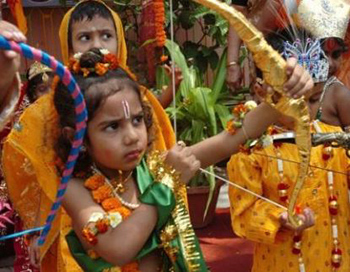 Ram Navami is the auspicious day that Hindus celebrate the birth of Lord Rama. Ram Navami usually falls in the month of March or April. Lord Rama being an avatar of Lord Vishnu was born in human form with the purpose to battle the invincible Ravana. The birth of Rama has great significance and hence Ram Navami is celebrated with great enthusiasm by Indian Hindu's all over the world. The festival of Ram Navami is celebrated with great devotion especially at Ayodhya. Chariot processions of Rama and his wife Sita, brother Lakshmana and devotee Hanuman are taken from many temples. Huge fairs are organized which would last for almost two days. The glory of Rama is recited and read out from the Ramacharitamanas. Public worship of Vishnu is held on this auspicious day chanting the vedic mantras dedicated to Lord Vishnu and giving offering of flowers and fruits to the Lord. Devotees keep a fast throughout the day, breaking it only at midnight with fruit. You can now send online invitations to several people at once using online invitation tools like Yoovite,Com. Simply choose a template for Ram Navami and enter the details before you send them to all your friends and relatives. The easy RSVP option allows you to take a count of the guests coming to the party, well in advance. On this auspicious day, people clean their houses and premises well and decorate them exquisitely. 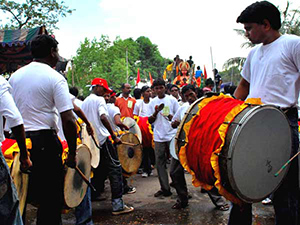 As to welcome the chariot procession of Rama and Sita, they adorn the streets well using all the best colors. The Ram Navami recipes are some of the traditional dishes that people relish after observing the fast. These recipes are quiet easy to make and all the ingredients are easily available. Some of the lip smacking recipes of Ram Navami are Panchamrith , Kalakand and Kheer. Send online invitations with Yoovite and come together on this special day to devote yourself to Lord Rama and celebrate the festival together.